Macedonians speak the Sclavonic language, Alexander's Charter, 1630! 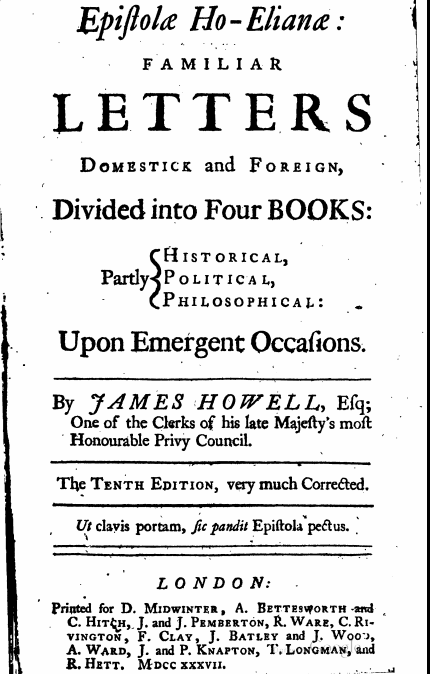 Source: "Epistolae Ho-Elianae:Familiar letters" by James Howell, 10th edition, 1737. 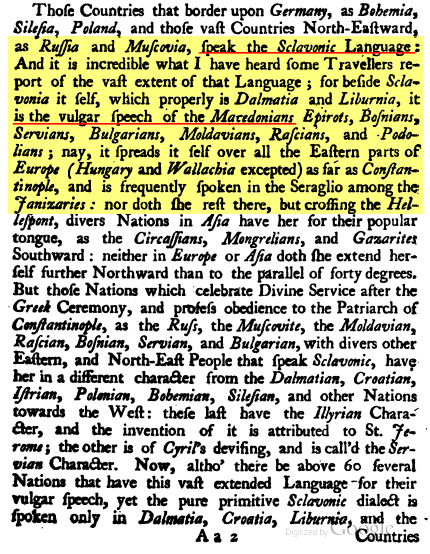 There were Macedonians in 1630 AD they spoke a Sclavonic(Slavic) language they were heirs to Alexander the Great. Can it get any clearer then this? We Macedonians were and will always be Macedonians. Daskale, you're like a hound dog. Well done! Fala mnogu, I am here to serve! I wonder where our southern neighbors are? Giorikas would you care to comment? or Svoliani? Really , where do you find this material? "We Alexander the Great , son of King Philip, founder of the Grecian Empire" Whats all this suppose to mean? Terms like 'to the north and south of Italy' ??? Whats the 12th of the Godess minerva?? what month is that? Im guessing March, i dont know help me out. Really now, what on earth is this suppose to mean??? Last edited by Svoliani; 11-20-2008 at 04:24 AM. 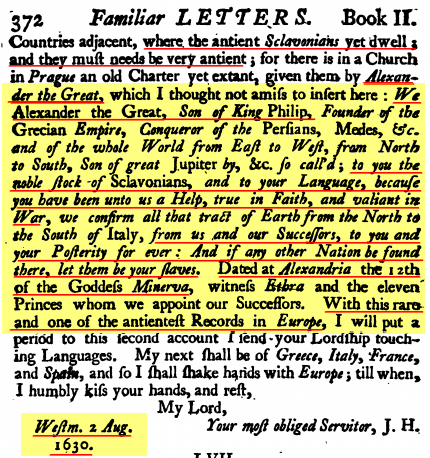 Just concentrate on the first part then were it clearely states that the MACEDONIANS and many other peoples of the EAST speak SLAVIC this beaing a FACT in 1630, this information is handed over to the KING of ENGLAND, his majesty Charles I of England who ruled between the years 1625-1649. So, are you saying that the King of England at the time has been fed with the wrong information? Eddie boy, have a crack at that one and tell me what you think it means, as I am sure you will be able to conjure something interesting with your grkoman interpretations. Can there be any doubt ?! This only corroborates what Orbini was saying. Speaking about his time the Macedonians not only spoke the Slavic language but spoke the same language as the ancient Macedonians. Now Orbini cites sources - so it appears that this was a widely accepted belief at that time - at least in the Latin sources.